Tesla announced the launch of a new in-house Personal Contract Purchase (PCP) program in the UK. The new program is significantly more flexible than Tesla’s prior options and now allows new buyers to choose the amount for the deposit, mileage and duration of ownership. 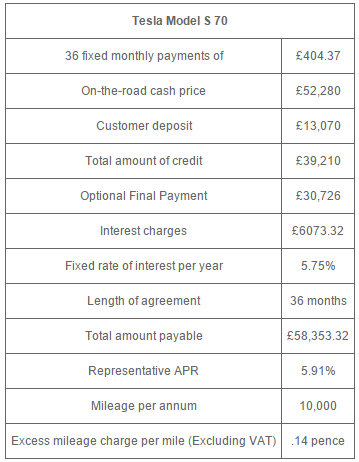 The new PCP can lower the monthly payment of a Model S 70 to only £404, which is significantly lower than the US equivalent – $576 vs $698 converted in USD. Although the PCP program appears to be here to stay, Tesla specifies that the low price of £404 is a limited time offer. Today, Tesla is launching a new in-house purchase option called Tesla PCP (“Personal Contract Purchase”), with enhanced flexibility and an attractive low monthly payment starting at just £404 per month. After fuel and road tax savings, that’s the equivalent of paying just £296 per month for a comparable combustion engine car. Monthly payments can be even further reduced with deposits up to 30%, or a minimum of only £2,000. With two and three year PCP options, no early repayment penalties or hidden fees, and support for various mileage terms, this new programme opens Model S ownership up to a wider audience. To celebrate the launch of Tesla PCP, we have reduced the monthly payments for a limited time only. On the right, you can see an example of how you can get the monthly payment down to £404 under the new contract. As usual, Tesla also advertises a cost “after fuel savings”, but that’s highly dependent on your mileage. The company is talking about £296 per month after fuel and road tax savings under the same PCP structure. Tesla also offers different mileage limits. The £404 monthly payment is achieved with the lowest option, which is for 10,000 miles per year, but you can also choose 15,000, 20,000 or 25,000 miles. Same goes for the deposit, which starts £2,000, but can go up to 50% of the cash value – £13,070 in the example. Tesla also offers trade-ins as part of the transaction. As per the same email blast, the company updated its certified pre-owned inventory for the UK. You can now buy a pre-owned Model S for £40,600.